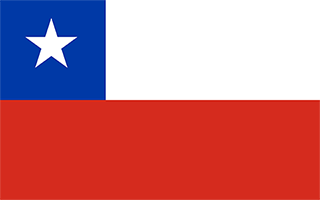 Chile with its capital Santiago is located in South America (Southern South America, bordering the South Pacific Ocean). It covers some 756,103 square kilometers (slightly smaller than twice the size of Montana) with a population of 17,789,300. Spanish is the official language spoken by people in Chile. Argentina, Bolivia and Peru are bordering countries. Chile narrowly stretches along the southern half of the west coast of South America, between the Andes and the Pacific Ocean. Spanish is the official language in the country and is spoken by almost the entire population. When entering Chile (by cruise, vehicle or plane), at customs, travelers will need to fill out a tourist card that allows them to stay for up to 90 days. Travelers will have to present the tourist card to Customs officials when leaving the country. Be aware that hotels waive Chile's 19% room tax when the guest shows this card and pays with U.S. dollars. Chile has a rather good airport infrastructure. The main hub for flights in Chile is the Arturo Merino Benitez International Airport (SCL) in Santiago, from where several airlines serve even the remotest corners of the country. Never exchange money on the streets, specially if a helper indicates you to follow them. It's not advisable to exchange currency in the hotel or the airport as the rates are awful. Just be patient. Banco Santander has a monopoly on the ATMs of the airport and will add a surcharge of 2500 CLP for retrieving cash - it's still better than the exchange bureaus. With such an enormous coastline, you can expect fish and seafood almost everywhere. Locals used to eat bundles of raw shellfish, but visitors should be cautious of raw shellfish because of frequent outbreaks of red tides. The topography is low coastal mountains, fertile central valley, rugged Andes in east. The average density of population is about 24 per km². The climate in Chile can be described as temperatedesert in north, Mediterranean in central region, cool and damp in south. Potential natural disasters are active volcanism, severe earthquakes, significant volcanic activity due to more than three-dozen active volcanoes along the Andes Mountains; Lascar (5,592 m), which last erupted in 2007, is the most active volcano in the northern Chilean Andes; Llaima (3,125 m) in central Chile, which last er and tsunamis. To reach someone Chile dial +56 prior to a number. The local cellular networks are operated on 850 MHz, 1900 MHz, 3G, 4G. Websites typically end with the top level domain ".cl". If you want to bring electric appliances (e.g. battery chaarger), keep in min the local 220 V - 50 Hz (plugs: C, L). The sign for the locally used currency Peso is CLP. Two equal horizontal bands of white (top) and red; a blue square the same height as the white band at the hoist-side end of the white band; the square bears a white five-pointed star in the center representing a guide to progress and honor; blue symbolizes the sky, white is for the snow-covered Andes, and red represents the blood spilled to achieve independence.